Ambassador Susan Rice talks with FIU's Model UN Delegates! 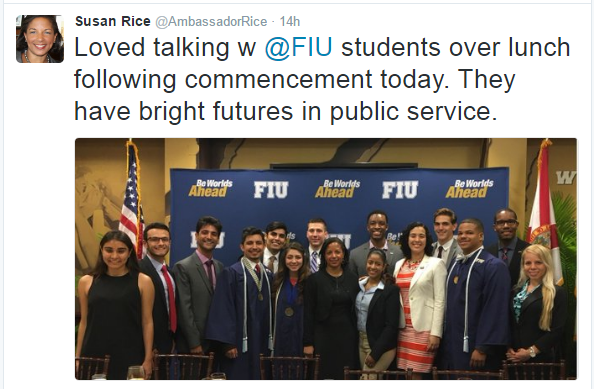 On May 11th Ambassador Susan Rice gave an incredible commencement speech to the 2016 graduates of the Steven J. Green School of International and Public Affairs. After the speech the National Security Advisor to Barack Obama and former US Ambassador to the United Nations had lunch with Model UN delegates discussing policy, lessons learned throughout her career and where she sees the country and the world going in years to come. The Model UN Program at FIU has to thank the University, Dean John F. Stack Jr., President Mark B. Rosenberg, all of the great folks at FIU who made this opportunity possible, and of course Ambassador Rice and her team. Her kind words about the future of our students are a reflection of their commitment to excellence. We loved talking with you Ambassador Rice!